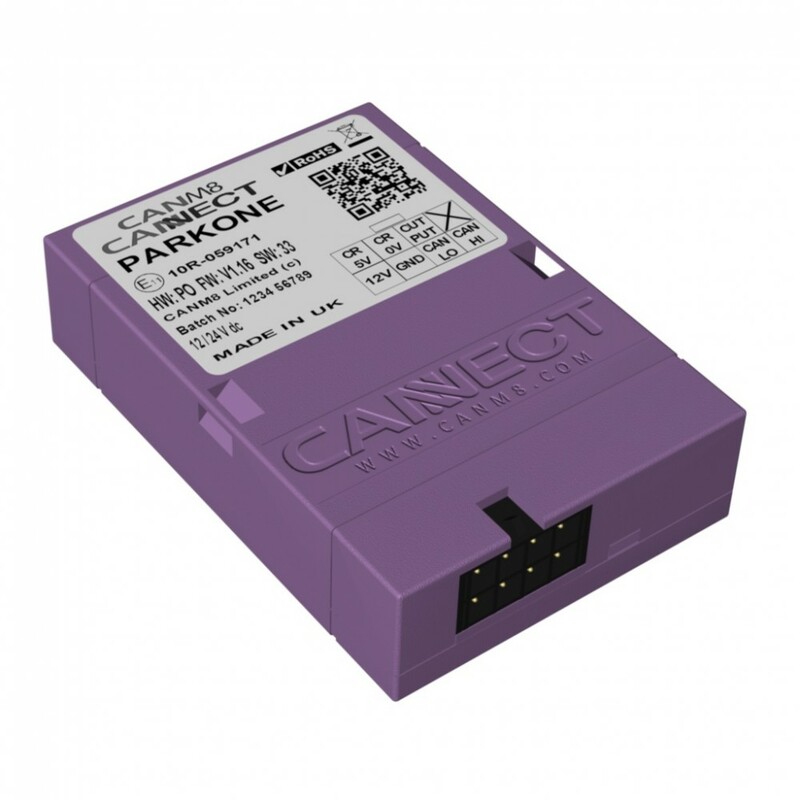 The CANM8 CANNECT PARK ONE is a CAN Bus interface that provides accurate control for after-market front parking sensors, side view systems and other equipment that requires a control signal within a specific speed range. Speed > 12v (1A max) when the vehicle speed is 0 - 6 MPH. The CANM8 CANNECT PARK ONE is ideal for use when installing after-market front parking systems that require a control input between 0 - 6 MPH. If you cannot find a product that meets your exact requirements, then please contact us directly as we specialise in designing custom software and will be happy to discuss your requirements further. If you do not see your vehicle make model or year in the list below, please contact us directly as we may still be able to provide a solution for you. The interface features a mini wiring connector, which unplugs to allow easy installation. There are 2 connections to the vehicle CAN Bus wiring (CAN HI & CAN LO) along with a connection to a permanent, fused 12v power supply and an earth connection. The interface incorporates a multi-function status LED, which indicates correct connection to the CAN system, CAN activity present and confirmation that the CAN identity has been recognised. Flashing Red: Searching for CAN information. Solid Red: CAN Data received but vehicle not yet identified. Solid Green: CAN Data received and vehicle type recognised. Flashing Green: Vehicle speed detected. RED > Connect via a 5A fuse to a SWITCHED 12v supply. BLACK > Connect to a good chassis GROUND point. WHITE > CAN HI Connection : Vehicle CAN HI wire. BLUE > CAN LO Connection : Vehicle CAN LO wire. PURPLE > Speed Dependent Output : 12v (1A max) when the vehicle speed is 0 - 6 MPH. The CANM8 CANNECT interfaces are the latest development to our range of CAN Bus products, these products feature some unique advantages over general CAN Bus interfaces. The most important feature of the CANNECT range is that they are updatable. The CANNECT product firmware is under continual revision to keep pace with the latest vehicle applications. The CANNECT update service is available to our trade and account customers and requires the purchase of our CANNECT-RUI Interface to access the latest software file downloads. Please enquire if you are interested in our CANNECT-RUI service and we will aim to assist you. Another important feature is our Remote Support Service. The CANNECT-RUI is a dual function interface that not only provides the software update to the interface but can also be utilised by one of our engineers to remotely analyse new vehicle CAN systems or issues with existing compatibility. All that our customers require to benefit from this service is a laptop or notebook PC and a sufficient internet connection. We aim to rectify compatibility issues and offer compatibility to new vehicles within 1 hour of connection. All CANNECT interfaces feature a bi-colour status LED that provides a clear indication of the interface operation. Most CANNECT products also feature direct compatibility with our contact-less CAN Bus reader to enable connection to the CAN system without any metal to metal contact.